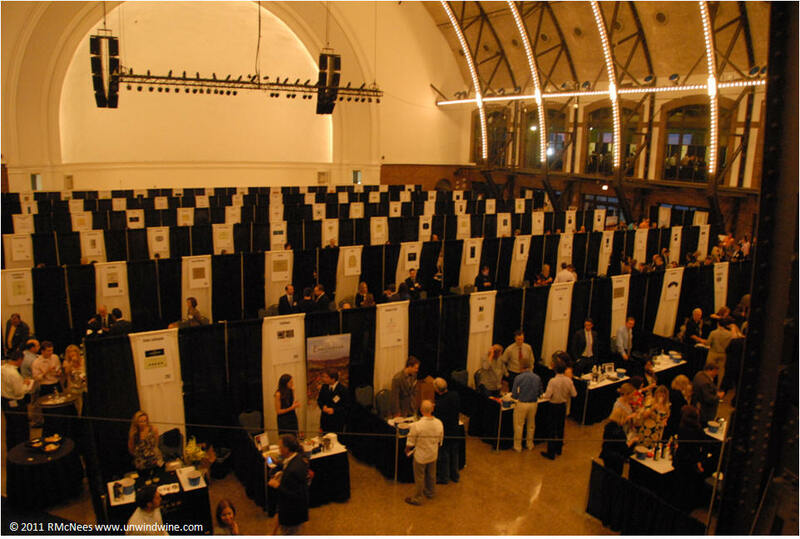 One of the ultimate wine tasting experiences besides actually visiting wine country is Wine Spectator's annual/bi-annual* Grand Tour - a wine tasting extravaganza of over two hundred producers. 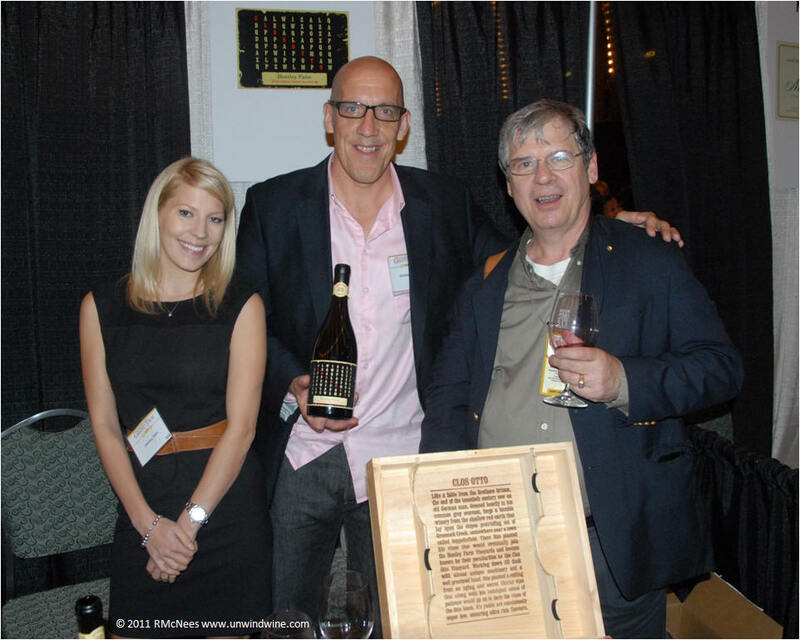 While its not a substitute for visiting wine country, it is an opportunity to meet the winemakers or producer representative directly, rather than their local distributors, which is the case is most tasting events. There is something for everyone from standard bearer First Growths to breakout producers and new vintage releases, some revealing the artwork of new winemakers. A highlight is discovering new emerging labels or established labels entering new markets. Such was the case with the 2011 Grand Tour bi-annual visit to Chicago. Again this year it was held at Navy Pier's Grand Ballroom. * Most cities including Chicago host Grand Tour every other year. Such a broad and diverse offering can be daunting. One can approach the challenge of so many choices several ways - look for new discoveries, focus on known producers' new releases, wander serendipitously or randomly, or some combination thereof. We develop a detailed plan of what producers we want to visit and then determine tasting based on what they are serving - avoiding lackluster features and offerings we've already experienced. Our tasting route follows countries and regions that we know and collect - no room for experimentation in our plan. Tasting so many wines in one evening quickly overwhelms the palate so we taste wines with which we have previous experience or familiarity. Lack of or diminished palate discrimination hinders wandering into new realms.We also focus on the more complex sophisticated wines early and move to the bigger, 'narrower' wines from there. You probably figured out by now - we taste reds and don't spend time on whites at such an event - the sole exception being Inniskillin Niagara Peninsula Riesling Icewine 2007 which was according to plan. We tend to focus on our selections and not be tempted to venture off plan otherwise one will never get through their preference list. We've been very diligent in keeping to our plan over the years although we deviated moreso this year than previously due to the size of our group. Our preference list was only fifteen percent of those available which is still thirty wines. I hit all but the most of the last half dozen which were ports as I ventured off and did explore some discoveries in chosen categories, such as the Aussie Shiraz's mentioned below, for example. 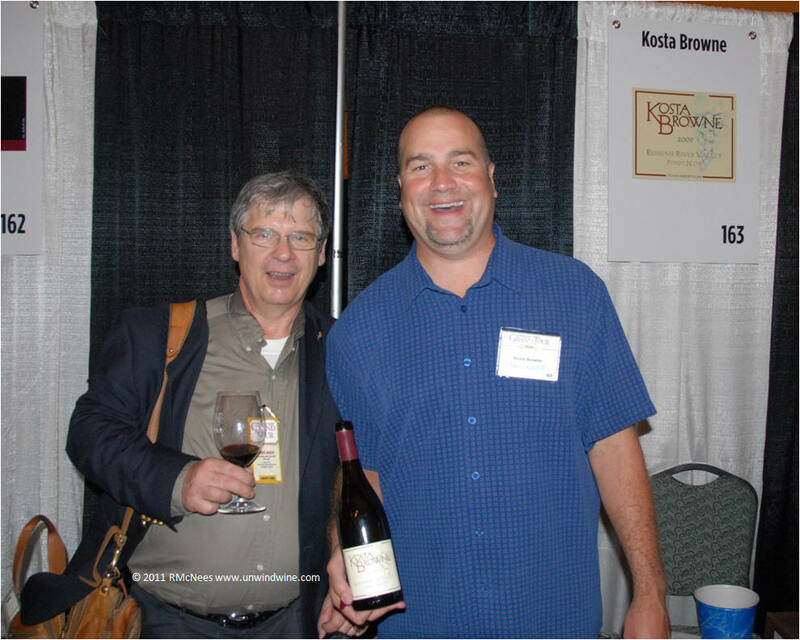 In the Pinot Noirs, we tasted perennial favorites Kosta Browne Russian River Valley 2009, Domaine Serene Evensted Reserve 2007, and Freestone Sonoma Coast Pinot Noir 2007, as all were pouring as yet untasted new releases. 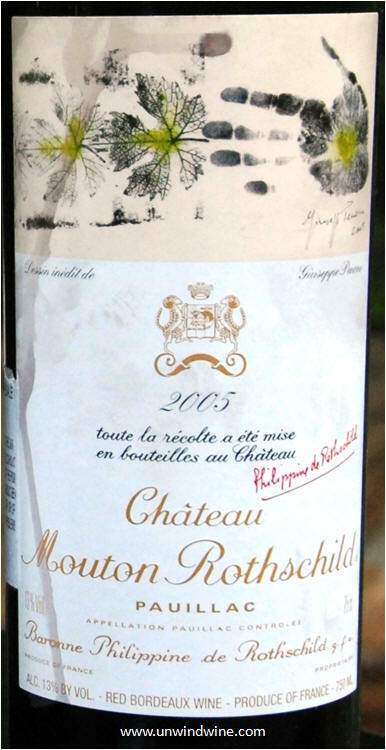 The first growth Bordeaux features were Chateau Mouton Rothschild serving the spectacular 2005 vintage and Chateau Margaux pouring their 2004. We started with these as the chance to taste First Growth Bordeaux wines is a special occasion and valued experience. A Pauillac comparison was available with the Lynch Bages 2005, and the Pontet Canet 2008. Margaux was best represented of the Bordeaux appellations with Chateau Margaux, Chateau Palmer 2004, Brane-Cantenac 2003, Du Tertre 2005, and Giscours 2005. St Estpehe was represented by long favorite Cos d'Estournel. Standouts from the Bordeaux' besides the Mouton were Lynch Bages, Brane-Cantenac and the Cos d'Estournel. Conspicuously modest and subdued was the Chateau Margaux '04 - perhaps too young to reveal itself. 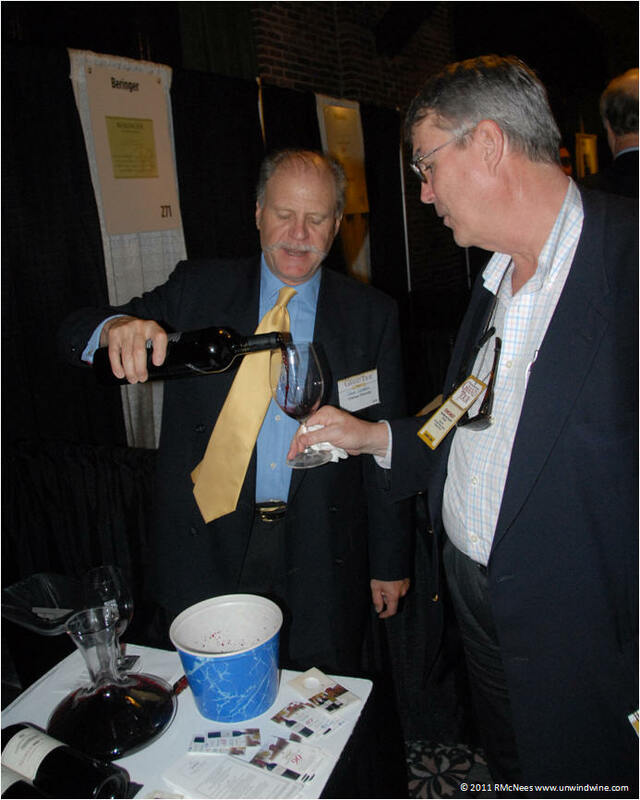 Consensus highlight of the 'Big Cab' offerings was the Joseph Phelps Insignia 2006 with its rich chewy forward fruit and complexity. Notable entries were Niebaum-Coppola Rubicon '06, Beaulieu Vineyards Georges De Latour '07, Cliff Lede Poetry '07, and Beringer Private Reserve 2007 Cabernet Sauvignons. We passed on the Robert Mondavi Reserve Cabernet, Chateau St Jean Cinq Cepages and Etude. A new release offering that showed well was Gemstone Vineyards Yountville Ten (10th Anniversary Release) 2006 which is now made by Phillip Melka. The consensus underachievement was the Caymus Special Select 2008 as I was alone in our group to give it high marks. We overlooked and missed the 2007 HALL "Exzellenz" Sacrashe Vineyard Red Wine ($165) not recognizing yet another new label, which was unfortunate given her recent spectacular releases of her Kathyrn Hall label. We skipped the Provenance having just recently enjoyed their 2007 Cabernet (perhaps their best to date). The Australian Shiraz category featured several new discoveries including Two Hands 'Zippy's Block' Single Vineyard Ronnefeldt Road Marananga Barossa Valley Shiraz 2007, D'Arenberg poured their highly rated 2006 vintage Dead Arm, Penfolds their RWT (we skipped both having already tasted), and Mollydooker poured their top shelf Velvet Glove Shiraz 2009. Two other Australian Shiraz discoveries of the evening were the Chateau Tanunda very limited release 2008 'The Château' - '100 YEAR OLD VINE' Shiraz and Hentley Farm 'Clos Otto' Barossa Valley Greenock Creek Shiraz 2008. Pictured at left is Chateau Tanunda's Dagmar O'Neill pouring 100 Year Vines Shiraz for Bill C.
The Grand Tour remains a highlight of our tasting experiences each year. 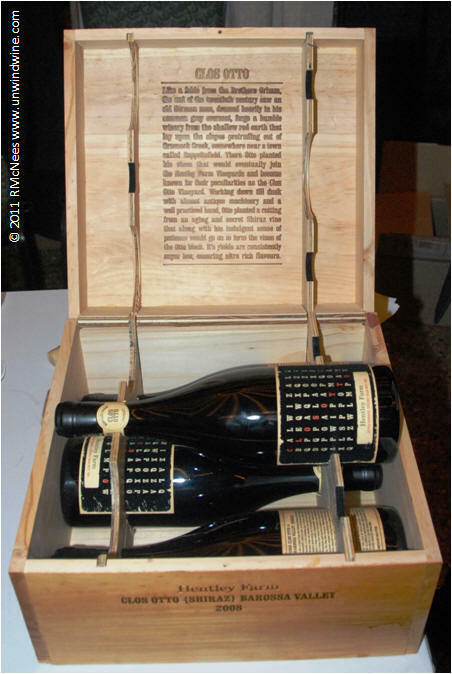 At $200 it is not for the every day casual wine drinker or those content/satisfied to drink modest wines. For those looking to test their palate discrimination, to explore a wide variety or broad selection of wines, then the tour offers just that. of course there are many wine tasting opportunities out there that are less extravagant. With so many selections, care must be taken to pace, spit, and cleanse - not drink/taste too much too fast, spit rather than drink (swallow) if you're looking to taste more than you would normally drink, and rinse and cleanse your palate with the furnished water, bread, or crackers regularly to maintain any sense of discrimination. This year, based on lessons learned in years past, we ate just before arriving which reduced the distraction of the institutional buffet food., and time taken from the wines. As we're not getting younger and some have bad knees, next year we'll absolutely have to pre-arrange for transportation back to the hotel - and as such we got hotel rooms in the city to simplify getting home at the end of the long evening. All that said, we're 'All-In', looking forward to the next Grand Tour, which regretably but also thankfully is at least a year away! The jury - Rick, Ernie, Bill, Dan, Eric and Lyle.